The internet told me that Matheson, Colorado, has a population on 94. My eyes told me that number seemed sort of exaggerated. I wouldn’t have been here at all, except that I decided (on a whim that turned into an Absolute Mission) that on our trip to Colorado, we would completely avoid driving on any Interstates. That made for some interesting routes, and included quite a few miles on unpaved roads. One of those unpaved roads brought us here, to an abandoned church guarded by dead trees. 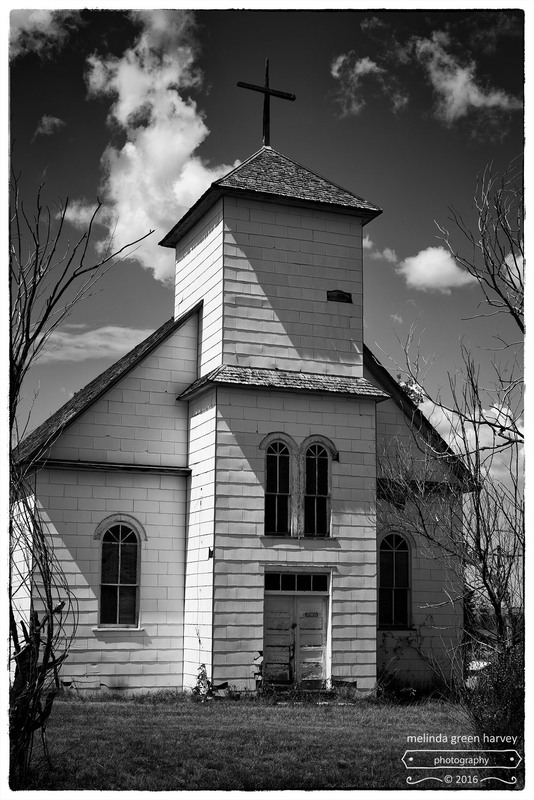 Posted on September 13, 2016, in Photography and tagged 365 photo project, abandoned buildings, abandoned church, back roads, black and white photography, Leica, Matheson, Matheson Colorado, melinda green harvey, monochrome, one day one image, photo a day, photography, postaday, unpaved roads. Bookmark the permalink. 10 Comments. It was LITERALLY atmospheric that day – the wind was so strong that it was hard to stand still enough to get the shot! The wind blew something into my eye, too – I am pretty sure it was either a full-scale boulder, or one of those wooden shingles from the building. Ouch! I think you’re right.. there definitely doesn’t seem like 94 people there. Anytime I’ve been through it, the only people I’ve seen there are the other people in the other cars on the highway not stopping in Matheson. There *might* be 9.4 people there, you think? That must be it… they forgot the decimal. Love your sharing part of a wonderful drive. No interstate use ? That just might be unAmerican ! Thanks, Richard. It sort of took on the feeling of a journey, for several reasons (which you’ll see in upcoming days) (which is how I make sure you’ll come back to the blog). I don’t know if it’s un-American, but it’s certainly not normal. Except for me – it was completely normal for me.